Having lived in Taiwan for a few years, I rarely left the city of Taipei. This last visit, I decided to visit the location in Taiwan that attracted the most tourists Taroko National Park in Hualien. The park is truly beautiful surrounded by marble and cliffs. There is a less known pathway, where you can take a long stroll rarely to encounter others. During national holidays the park can get pretty packed with tour buses and traffic jams, which interferes with the picturesque mood. 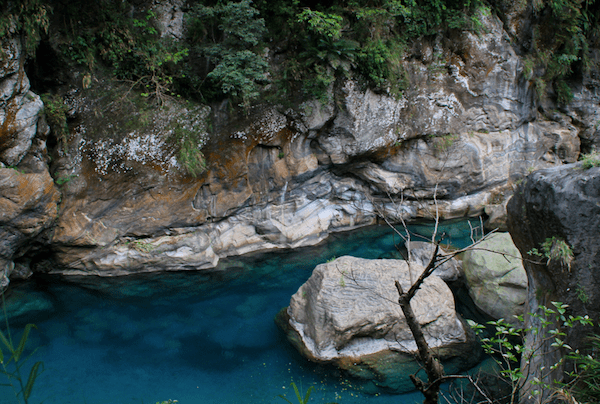 The city of Hualien offers a majestic coastline with beaches and speciality foods you can also enjoy. Jiaoshi is a small town located just off the coast. Jiaoshi is known as a hot springs city with a hot springs water park in the town center where anyone can go and dip their feet in the water, day or night. The hot springs have a comfortable average temperature of 58 degrees Celsius. There are minerals in the water that are said to help promote healthy blood circulation and relieve muscle pain. You can choose from many hot spring establishments in the area, all overing rooms with private baths. Jiaoshi is also known for having a beautiful three-layered waterfall within the city. Some other activities to do in Jiaoshi are hiking and mountain biking with trails you can find throughout the major mountains. There are a plethora of cafes and restaurants to choose from of local cuisines from Taiwanese native tribes. I enjoyed Jiaoshi – a pleasant escape from the city.